Seeing as the festivities are over I can now get back on track! I have continued on with Step Eight. Painting in more areas and trying to be as accurate with my colours and placement as I can. I want to avoid having to go back and correct areas since my time is limited on how long I can work on this painting. Step Eight: Continue painting with oils. In my last post I mentioned that I would be tackling the lids, well there they are. Only blocked in but they help with grounding the paintings dark areas. I will go back into them to get the spirals right and make sure that the shapes are technically correct. Circles in perspective can be rather tricky! Usually when I paint, I like to finish one object or area. Why? I find this helps boost my confidence in realizing that the paintings completion is an achievable goal. It’s sound advice I received years ago from one of my painting teachers in College. Though I have taken liberties in adding “completion is achievable.” Regardless, I definitely find that realizing one area of the painting does help with tackling other areas of the painting, especially if you become stuck. In this painting I’ve completed the small salt shaker? Not entirely sure that’s what it is but I’m going with Salt and Pepper Shakers! 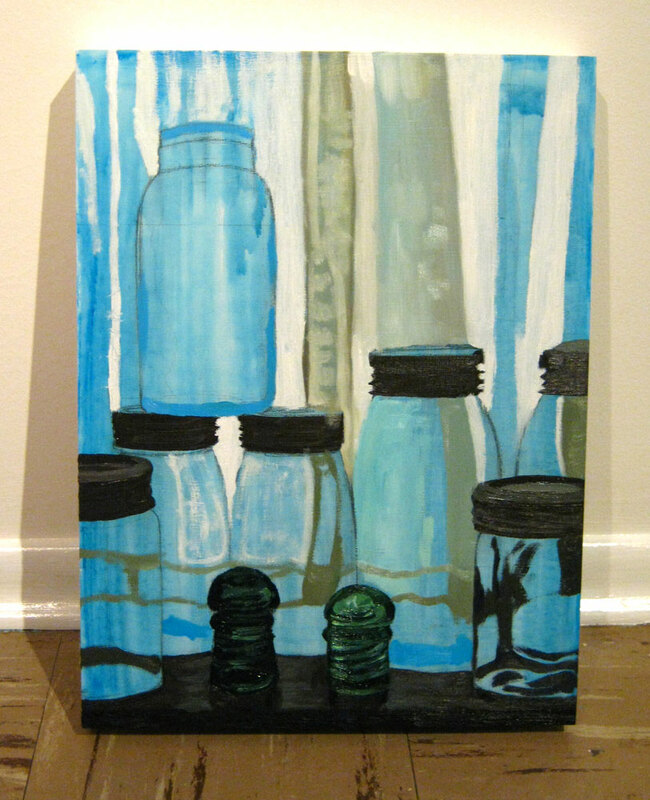 Actually for this painting I am being challenged by the cyan blue found in the jars. I had a look at the blues that were in my painting arsenal and alas I didn’t have one that was even close to being comparable to cyan. After searching M.Grahams blues online I found that their Manganese Blue Hue seemed to be the best match. Now that I have added Manganese Blue to my arsenal, I tried mixing a suitable blue or “cyan” BUT I can only get a shade that is not as intense and saturated as the cyan. It’s slightly frustrating as I really, really love that colour. It reminds me of tropical waters, with white sandy beaches and lazily leaning palm trees. I’m really going to try crazy hard to get the colour match just right! My plan is to mix Manganese with a little Ice Green by Holbein and add a miniscule amount of yellow. Fingers crossed that I will come to some sort of compromise! P.S. I’ve come up with a proper title. Cool and Collected. What do you think? Does it work?